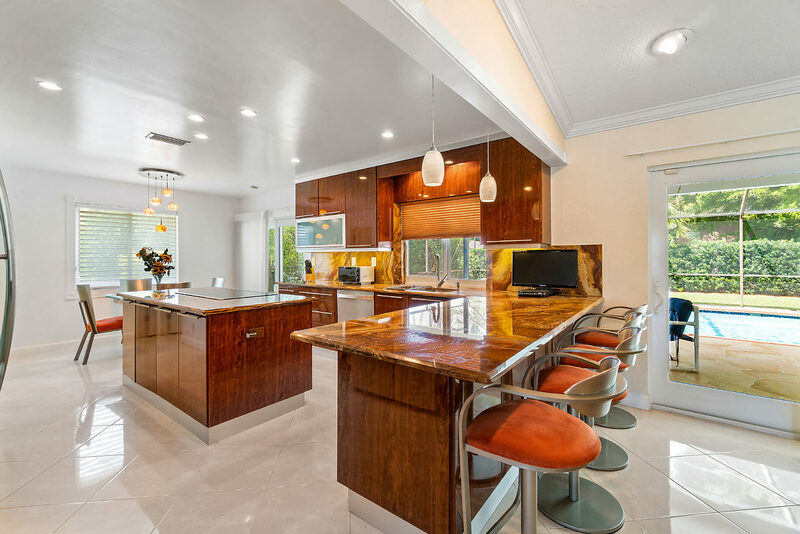 This gorgeous open floor plan home boasts fully upgraded chef's kitchen with elegant European-style cabinetry, premium granite countertops, stainless steel appliances, new refrigerator (2019) with center cook island. Other features and recent improvements include hurricane-proof windows and garage door (2018), built-in wall units, murphy bed set and desk, built-in master bedroom set, all closets are fully built-out, electric powered window treatments in bedrooms, 'instant hot' water tank, built-in electric air filter for improved air quality, recessed lighting with dimmer switches, vaulted ceilings, crown molding and tile flooring throughout. Totally upgraded bathrooms feature modern custom vanities and sinks, Toto toilets/bidet with beautiful stained glass accents and cabana doors to pool. Backyard features in-ground pool with new screening (2019), sculptured stone deck, new patio flat roof (2019) overlooking perfectly manicured lawn and landscaping on oversized lot!